For as long as comic books have had an online presence, Jon Morris has been a fixture on the scene. His website, Gone & Forgotten, launched in 1997, and although there have been a few hiatuses along the way, it has been operational for almost 18 years, which is multiple lifetimes online. Along the way Morris became one of the world’s experts—if not the world’s expert—on lame superhero comic books. In 2001 he appeared on an episode of This American Life to discuss the subject, and last month saw the release of his first book, The League Of Regrettable Superheroes. For The A.V. Club’s annual Comics Week, we spoke with him about his new book, his long career as an internet humorist, and the phenomenon of “loser superheroes” in general. The A.V. Club: Your name has become inextricably linked to “loser superheroes.” How does it feel to be the world’s expert on the subject? Jon Morris: Well, I wouldn’t use the term “loser.” There’s still a lot to celebrate and champion about these creations whether they’ve reached the heights of popularity and ubiquity of something like Batman or The Avengers. We used the word “regrettable” for the book because it granted us some versatility in discussing the reasons for the characters’ downfall, and it wasn’t as heavily burdened with an inherently negative judgement as other possible terms. Along those lines, I named my blog Gone & Forgotten because those were the only qualities that I felt nominated a character for this peculiar fraternity—characters and stories consigned to the superheroic scrapheap of history. As for the accolade, it’s a mixed blessing. I love talking about these oddball creations, their creators, and the context surrounding their typically short-lived legacies, and I’m gratified to find so many like-minded fans lurking around. On occasion, unfortunately, I’m confronted by someone with a real axe to grind about the perceived slight against a favorite character, or worse, a creator. I’m not the only person on the internet who’s made these B-listers their bailiwick, but I think the heightened visibility that the book gives me makes me the most feasible target for die-hard fans of forgotten four-color crimefighters who feel their favorite figure’s been getting a short shrift. AVC: You walk a narrow line between generating laughs at the expense of genuine “morts” and conjuring sincere respect for lost concepts, characters, and creators who for some reason never clicked. There are tons of characters in your book who might have been more popular or interesting under different circumstances. Except for Skateman, who is irredeemable. How hard is it live between mockery and affection? JM: When you love something, you can laugh about it, because if you truly love something then you understand it—warts and all. You can put the thing you love into context, and with most things you’ll see that it’s at least a little absurd. When you love yourself, you can laugh about yourself, when you love someone else you can laugh together about all-too human peculiarities and peccadilloes and plain ol’ flaws. It’s not hard to translate that to comics, which is a medium I genuinely have a great deal of affection for, and superheroes, which are a genre that means the world to me and that I have tremendous nostalgia. It seems impossible to take superheroes so seriously that you couldn’t look at something like all of Superman’s convoluted backstory—his ant-head, his flying dog, the time he drove a car with big silver fists instead of headlights—and not be absolutely delighted about it. There’s nothing about seeing the humor in an idea which inherently denigrates it. I feel it celebrates it; it adds deeper emotional meaning to it. When I started the blog, I fell into the same trap that a lot of similar blog writers do, which is to relentlessly sneer and throw shade on every character who passes before your crosshairs. I’m better these days, or at least I’ve been trying to be better about making my intentions clear. But even at my most vitriolic—and I assume that the same is true for writers still exercising their muscles in that fashion—I know I wouldn’t acknowledge a story or a character if I didn’t have some affection for it, regardless of how that affection was expressed. Mark my words: Somewhere there is the creator who can make Skateman work, and someday they will, and I hope I live to see it. I also hope it’s through the medium of Ice Capades. AVC: Gone & Forgotten has been running—with a few hiatuses—since 1997. Considering the comics blogsophere didn’t really begin until late 2003, that’s seriously prehistory, practically antediluvian in internet years. What got you onto the web so early? JM: Many hiatuses! Long hiatuses, too! I think I might’ve had a five-year break in there somewhere. Back in the day, I had a tech boom job, and one of the perks that went along with it was a personal website. This was back when a domain registration would set you back almost a hundred bucks, not to mention hosting costs, so it was nothing to sneeze at. No wonder I wasted it on weirdo superheroes and dumb comics. I don’t think we even had blogging software back then. I just hand-coded everything in HTML when I had a new page to post. Like our caveman ancestors once did. AVC: The comics internet didn’t take off until blogging software became ubiquitous and web hosting became cheap and/or free. But once it got going, many of the earliest blogs and websites were focused on precisely the type of content you specialize in—having fun with or at the expense of old comics—to the degree that riffing on old Jimmy Olsen comics still seems like the default setting for comics websites. Why do you think this type of humorous content became dominant? JM: Taking the powerful, even if fictional, down a peg? Making light of their own childhood idols? Killing the Buddha? I’m sure it’s different from writer to writer. Not to undermine my own narrative, but I suspect that it’s probably in no small part because it’s so easy. Superheroes are, when viewed from any remove, weird. 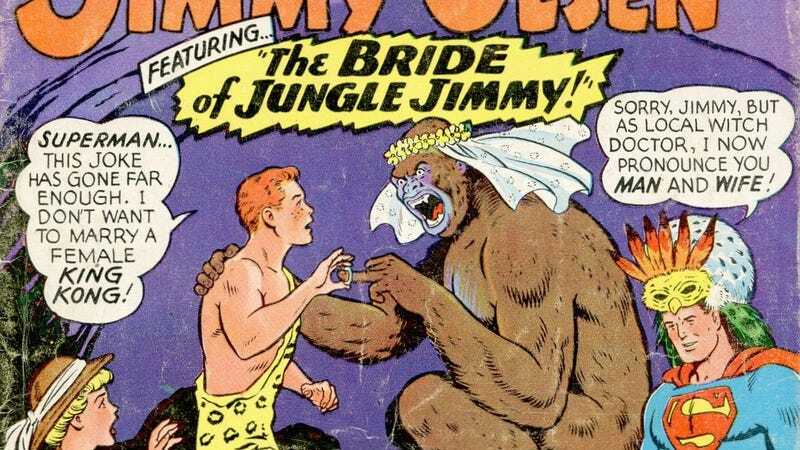 There’s not a lot of heavy lifting involved in wringing laughs out of the image of Jimmy Olsen in a Tarzan suit being married to a gorilla wearing a bridal veil while Superman stirs a cauldron and is dressed in some cod-Zulu Mardi Gras mask. That one writes the jokes for you. There’s so much of it, too, that it seems impossible to run out. Everybody can carve off their own definitive “weird comics” story. Superheroes were around for 25 years before anyone started trying to make them relatable. It was another 10 before they started toying with social relevance, and even then they spent a decade using “very serious” superhero stories only as a marketing gimmick—the companies would ask you to pick up a book because it was about drug abuse, or teenage runaways, or the menace of campus activism instead of a guy in a mask slapping another guy in a mask until the cops arrived. In the interim, every superhero comic was a little weird. Our cups overfloweth. It is gratifying, on the other hand, that a lot of the bloggers who are currently swimming in that particular water are writers who are capable of contextualizing the characters or celebrating their peculiarities as strengths, as opposed to merely pointing and laughing whenever they uncover an image of Superman using his heat vision to wreck one of Jimmy’s birthday presents. AVC: There’s no objective reason why Wolverine is “cooler” than Adam-X The X-Treme, but most would agree that one is better than the other. Ant-Man the movie is being at least partially sold on the idea that Ant-Man is kind of pathetic, and the movie plot will be about the character embracing his underdog status. Even though there’s no reason why Ant-Man has to be less cool than, say, Spider-Man. why do you think that happens not just in the comics community but also on a larger scale? JM: Well, it’s to the studios’ benefits to categorize their intellectual properties in easily consumable packages. The Marvel Cinematic Universe in particular has been good about branding their characters like a boy band—you have the cool one, the shy one, the bad boy, and so on. They’re going to yield big returns from making sure there’s basically a superhero character for every mood. That being said, though, fans usually only allow for one of a kind of any kind in their hearts, unless there’s something substantive to differentiate them. Everybody loves Batman, but if you just create another Batman, it’s going to get stuck in a cul-de-sac with nowhere to go—it either tries to be the Batmannest Batman and fails or retreats and stops being like Batman at all. On the other hand, make a hunky, quipping Batman and you’ve got Nightwing, make a dedicated, bookish Batman and you’ve got Tim Drake, make a daring, spunky Batman and you’ve got Batgirl, etc. Folks seem fine with this, I’m fine with this, it’s worked out just fine for decades. The problem with someone like Adam-X The X-Treme is that it’s just the variations on the theme without the core component that made the source material work. You’ve got Wolverine with more claws and more attitude and more in-your-face-attitude and his power is even more gross than stabbing someone with knives you hide in your forearms, but you don’t have the brooding man-beast torn between his animal instincts and his endless—and possibly fruitless—striving toward civilization and honor. Adam-X lacked that foundation, he was a character who was all adjectives and no nouns. AVC: Does it take something away from the comics when the characters notice and comment on these kind of differences? For example, it’s not uncommon to encounter scenes with other heroes commenting on how lame Captain Ultra or Gunfire are. Those judgments used to be left to the reader to make. JM: Superhero comics, above everything else, are a populist medium, and I think the writers and editors engaged in this sort of behavior are trying to echo the sentiments they’ve heard (or thought they’ve heard) from fans. It certainly doesn’t help any character get ahead—Squirrel Girl’s a welcome phenomenon right now, but that’s almost certainly in spite of no small number of her prior appearances, rather than because of it. There’s a lot more to be gained by giving a questionable character a second chance in another creator’s hands. There have been serious (maybe over-serious, to be fair, but well written at least) revisits to characters like Prez, B’wana Beast, Brother Power, Kid Eternity, Brother Voodoo, and even the Red Bee, which have given the characters a new opportunity to shine in their unique fashion, and which has generally yielded long-term gains in terms of storytelling. You can have your in-universe characters dismiss B’wana Beast and confine him to the super-scrapheap of history, or you can give him a fair shot with accomplished creators and see him succeed as a character in such disparate properties as Morrison’s very mature Animal Man series and the Batman: The Brave And The Bold cartoon alike. AVC: Is it too early to ask how the book is doing? What kind of reactions have you gotten? JM: I’m genuinely gratified by the response so far. It’s been overwhelmingly positive, and it’s additionally put me in touch with fans of these forgotten characters—sometimes to express their displeasure at seeing their favorite character included under the title “Regrettable,” but mostly just to talk about these characters with someone who’s heard of them. I’m not surprised to find that there’s a number of Fantomah, Nelvana or ROM fans out there, but I’m delighted to discover that there’s a significant number of Invisible Scarlet O’Neil and Dial H For Hero fans bustling about too. AVC: If you can manage to avoid being assaulted by a roving horde of Morlock 2001 fans, what’s next? What about the possibility of a follow-up volume—“Regrettable Supervillains” seems like it would sell itself, right? JM: Time will tell. I’d definitely love to write that volume, and there’s no end of potential subject matter. There would also be a bit of tasty irony in this book getting a sequel when so many of the characters in the book never made it past a single appearance.